The Blocking Filter are absolutely required for the safety and performance of telescopes for solar observing! Blocking filter will be mounted at the eyepiece-side of the telescope, and protect against the dangerous radiation from the sun. 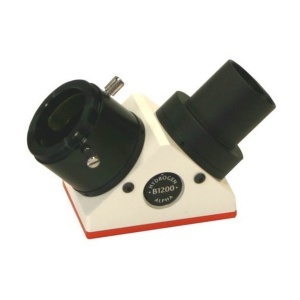 We are currently offering the B600d, B1200d, and B1800d in a 90° star-diagonal, with 1.25" on the telescope side. The Blocking Filter B600 is for maximum focal length 540mm, B1200 is for 1080mm, B1800 is for 1620mm and the B3400 is for 3060 mm maximum focal length. This is the focal length of telescope for which that particular blocking filter will provide a full disk image of the Sun. A blocking filter larger than that required is needed for imaging. Note: The picture shows B1200d Blocking Filter.